Healing Touch is an "energy therapy," one of many techniques and practices - including acupuncture and yoga - that subscribe to the ancient Eastern concept of energy flow along pathways in and around the body. In this tradition, a flow of energy through the body that's chaotic, blocked, or out of balance is associated with pain, disease, and emotional distress. Healthy energy circulation permits healing and contributes to overall health by relieving stress, and releasing destructive emotions. The Healing Touch practitioner balances the energy field that surrounds the body, and the energy centers located within the body, using touch and specific treatment techniques. This revitalization of the energy system allows self-healing to occur on all levels – physical, mental, emotional and spiritual. Healing Touch is a philosophy and way of caring, as well as a sacred healing art. 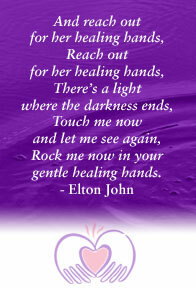 Healing Touch is a deeply relaxing, rejuvenating, holistic modality. It is defined as a biofield therapy - an energy-based, therapeutic approach to healing. Healing Touch uses over 30 different treatment techniques to balance and align the energy system of the body. The goal in Healing Touch is to restore wholeness and wellness through harmony and balance. Healing Touch is noninvasive, economical, and effective. Due to its power to relax and allow people to connect to their emotions, Healing Touch is useful to people who are undergoing life transitions. Healing Touch is also highly beneficial to people who have undergone traumatic medical interventions such as chemotherapy and surgery, because it is nurturing and administered by practitioners with years of experience and knowledge. The American Holistic Nurses Association endorses Healing Touch, which is a 2-year certification program practiced in hospitals, clinics and private practices worldwide. Children and animals also benefit from receiving Healing Touch. Mary Somano is a Certified Healing Touch practitioner, with a private practice in Magnolia, Tomball, and Houston area. Read more about Mary. feels so comfortable and soothing." - K.
If you would like to explore how Healing Touch can assist you with self-healing through energy system clearing and balancing, please call 713-254-2127 for an appointment or complete our Contact Form.